Vocal singing accompanied by an ensemble of tanpura, tabla and a harmonium can just begin your simplest yet pleasant journey into the most sophisticated and complex world of the North Indian Classical Music. 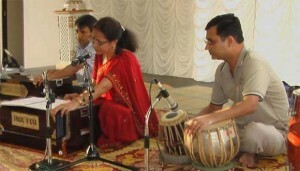 North Indian [Hindustani] Music classical or light music has a definite evocativeness about it. Its power to transport you to moods that you choose and wish from time to time depend on what ambience you choose to play in or listen to.